Get everything you need to adventure in the Forgotten Realms on the exciting Sword Coast, home to the cities of Baldur’s Gate, Waterdeep, and Neverwinter. Crafted by the scribes at Green Ronin in conjunction with the Dungeons & Dragons team at Wizards of the Coast, the Sword Coast Adventurer’s Guide provides D&D fans with a wealth of detail on the places, cultures, and deities of northwestern Faerûn. The Sword Coast Adventurer’s Guide is also a great way to catch up on recent events in the Forgotten Realms, to get background on locations featured in the Rage of Demons storyline coming in September, and to learn the lore behind video games like Neverwinter and Sword Coast Legends. · Immersive Adventuring: This campaign sourcebook provides players and Dungeon Masters material for creating vibrant fantasy stories along the Sword Coast. · New Character Options: The book offers new subclass options, such as the Purple Dragon Knight and the Swashbuckler, for many of the classes presented in the Player’s Handbook, as well as new subraces and backgrounds specific to the Forgotten Realms. · Adventure in the Forgotten Realms: Discover the current state of the Forgotten Realms and its deities after the Spellplague and the second Sundering. You’ll also get updated maps of this area of the Realms. · Compatible with Rage of Demons storyline: Make characters for use with the Out of the Abyss adventure and fight back the influence of the demon lords in the Underdark below the Sword Coast. · Insider Information: Learn the background behind locations, such as Luskan and Gracklstugh, featured in the upcoming digital RPG, Sword Coast Legends, from n-Space. 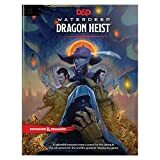 With new character backgrounds and class options, players will love the storytelling possibilities of playing a noble of Waterdeep, an elf bladesinger, or one of the other new options, while Dungeon Masters will relish a book full of mysterious locations and story hooks to keep players adventuring on the Sword Coast for years to come. Look for Sword Coast Adventurer’s Guide to be available on November 3.